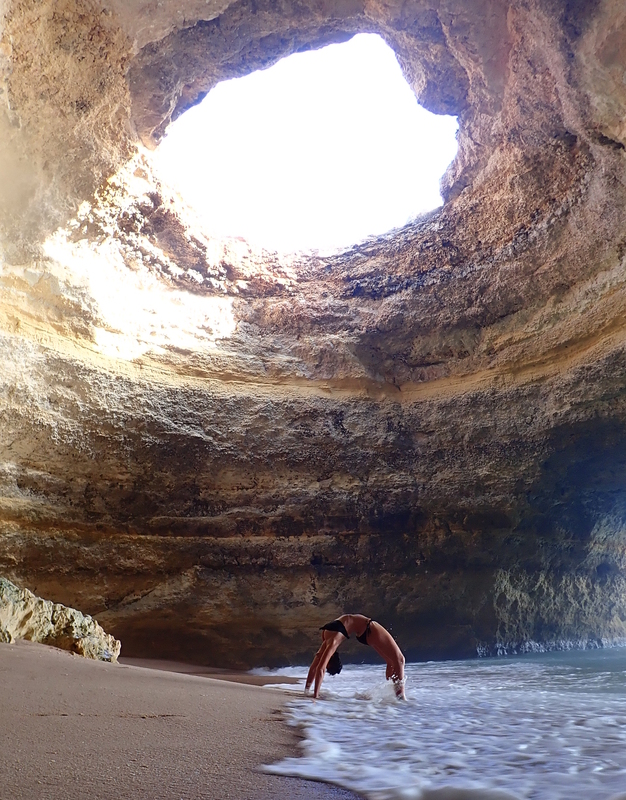 Kiki used her waterproof camera for this picture of Cristiana, our Yoga teacher, practicing in a famous cave that cannot be reached over land, only by swimming from the beach at Benagil. Healing and staying well depends on a healthy electric potential in the cells of our body, according to Dr Jerry Tennant, in his book Healing is Voltage. It can be promoted through acupuncture, exercise and by grounding, like walking barefoot on grass or in wet sand on the beach. Or swimming in the ocean, a health practice that is available every day here and becoming a new tradition for some of us. Cristiana took this one of Kiki, drawing the card Ordinariness today. 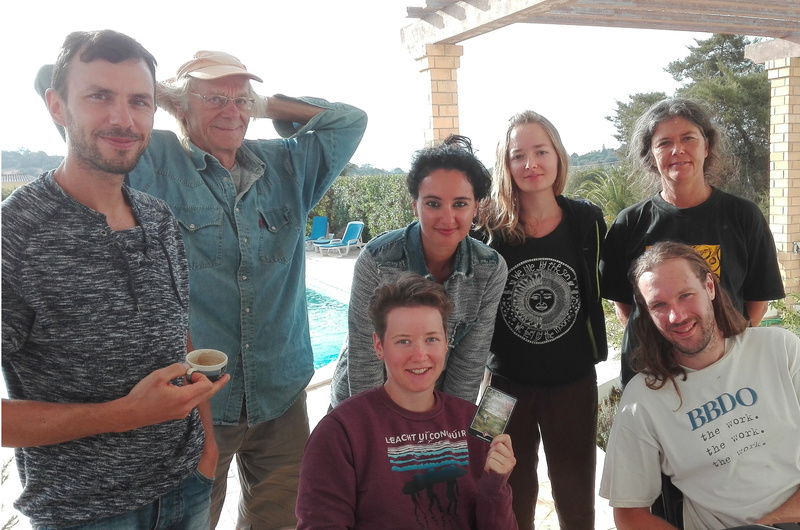 With Cristiano and me, Agnese (Italy), Mylène (France), and Iain (in front of Luisa). The way of Zen is living an extraordinary life in a very ordinary life: chipping wood, cleaning the floor, cooking food. Osho says: The whole question is of you doing it totally, enjoying, delighting in it. 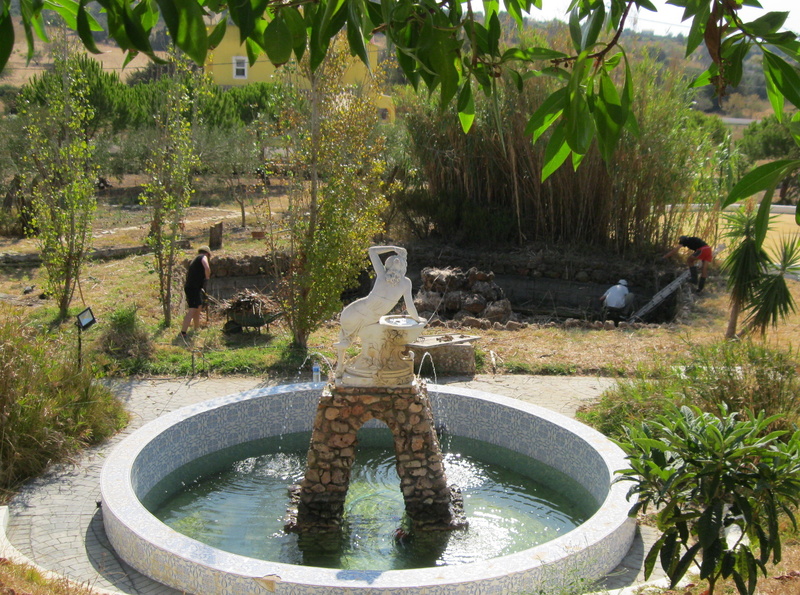 A picture of our Queen of Water, on top of the recently restored fountain, and overlooking the cleaning of the natural pond, by Cristiano together with Iain (UK) and with Kiki (Czech republic) helping to take the dead canes to the wood chipper for turning into compost. There are all kinds of maintenance jobs going on, preparing the garden for the winter and for pruning and planting of trees.